Oath of the Gatewatch is Wizard’s latest installment in their addictive tcg Magic: The Gathering. To me, BFZ was, for the most part, disappointing. I had high hope for the allies, but the best they could do was a gimmick Sac deck. Now, Gideon did provide some umph, some 60 dollar umph. I remained spoiler free and last week my girlfriend and I bought two of the pre-constructed decks. I got myself concerted efforts. A green/white deck that relied on the new Mechanic Support. Support reads “As this card enters the battlefield, Put a +1+1 on up to X creatures. Needless to say I love this mechanic. I’m a green player so getting to make my creatures bigger each turn worked wonders for me. Her deck was the vicious cycle deck. Its a green/black deck that wants to sacrifice creatures to gain advantages. It’s an okay deck, but for whatever reason she couldnt get it going until my army had already amounted. To combat this we gave her some plummets and other forms of removal like ultimate price. After that, she won the next four. We filled the deck with scion token producers and she sac’d them to activate bone splinters, so I never had a board presence. But hey, she was enjoying it! All in all, I barely feel like these decks gave us a taste of OGW. Our deckes were filled with a bunch more BFZ cards than I thought they would have. And I feel as if her deck didnt seem to redefine standard as much as it was just a rehash of the aristocrats style of play. I love the support mechanic and I’m definitely interested in building around it. The big draw back is it runs tiny creatures and at times(If I fell behind) support felt like a dead mechanic. You cannot support yourself so if there’s nothing on the field, Gladeheart Cavalry’s support is wasted. I still have more mechanics to fool with so I’m interested in seeing what else this expansion set has in store. Have you guys got a chance to get your hands on any OGW cards/deck yet? Wishing for white Christmas? I got you covered! This week we end our Beginner’s Guide to Magic. Where does the time go? White is honor and pride. White is about the army of many. It’s about justice and valor. White is all the little pieces that make the machine work. What’s the best creature type to represent white in this standard? Allies of course. Here’s a mono White Allies Deck I threw together! Summon as many allies as you can. The rally will trigger and give us sweet perks. Tithes and Felidar are the only non-ally triggers in the deck, so you should get them often. Remember Ultimating Gideon right off the bat can be the right play giving all our little guys +1/+1. If you can’t afford him put in Retreat to Emeria instead. 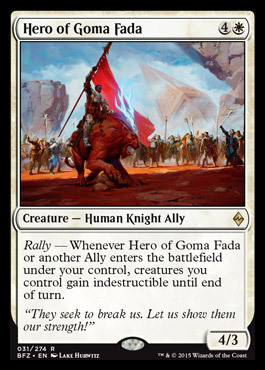 Also, if you want the consistency of the Ally triggers over the finishing nature of Tithes and Felidar, add 4 of Hero of Goma Fada. White are players who- like synergy with their creatures. Every creature works for the good of the whole. You will in no way have the biggest creatures, you will have no permission based cards, and no burn damage. You will, however, have creatures that go well together as well as solid removal. Kill and exile stuff that is in your way and then rally your way to victory behind first strike, double strike, etc. Pros- Everything goes together. You get to play Gideon. You have access to some of the best removal in standard. What you like in size and speed you make up in your army. In your brotherhood valor and justice will always shine through. Cons- You do not want to fall behind. Outside of maybe Soverign and Gideon, you do not really have a card that is going to just break the game. Be mindful of board wipes and know stabilizing might become more difficult the harder the hit, as a single creature will likely not win us the match by itself. No counter magic, no burn magic, and no pump spells(Outside of Gideon’s emblem) make us a little less exciting than the other colors but build your army and ruthlessly take down your opponent before they can mount a comeback. Beginner’s Guide to Magic is through, but Magic Monday will make a return in 2016 down the road. Until than check out more Magic Monday Here! In honor of the Star Wars movie, we join the dark side. You know the stories they tell you about witchcraft and voodoo and necromancy? Well that were here to do! Black wizards use tricks and savage tactics to manipulate aspects of the game. Often, they do not care about their creatures and gain perks when they die. Black is very twisted, but it is very satisfying. Creatures die! It’s part of the game, after all. Our deck just takes advantage of this. This deck is stylized in the form and aristocrats deck that runs cards that want to die. Were mono black and not fancy. So we do not run Rally The Ancestors. You want to be sac’n Bloodsoaked Champion because he can revive himself. Hangarback leaves tokens behind, which, in return, can sac’d themselves. Do this while Zulaport is on the field and you start to hurt your opponent. Sac’n as a result of Nantuko Husk can beef him up and just kill your opponent right there. Drana, Smothering, Gurmag are here to finish the deal. The spells are mix of goodies from removal to draw spells. Duress is good for control and Transgress picks stuff out that is bigger than us. Pros- Black cards give you some amount of say in what sticks around(In the form of removal). Like green, the little guys shine here. Though green pumps its creatures, black normally does not mind if it’s creatures die. You may not always have board presence because you are sac’n your creatures, but with all your removal they should have trouble establishing a board on you as well. Cons- As mentioned, your creatures are small. Drana is a flyer which helps, but she’s still a 2/3 for 3. Gurmag is a welcomed addition because you can delve all your sac’d guys to get him out for 1 or 2. Remember, black with go faster, green will get bigger, and blue will try to deny you, but you are the most wicked one of them all! Next week we finish the colors up with white! Until then check out more Magic Monday here!